Introduction: Research on Teaching 1: Teacher Characteristics A. Description of Characteristics B. Influence of Characteristics 2: Teacher Expectations A. Induced B. Review of Expectations 3: Teacher Perceptions A. Of School B. 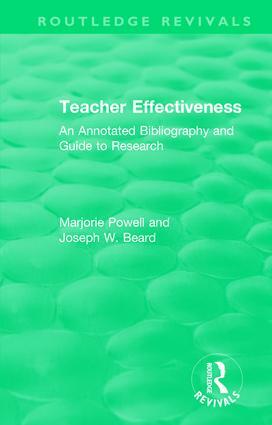 Of Themselves and Their Teaching C. Of Students 4: Teacher Behavior A. Descriptions of B. Consistency of C. Planning D. Factors Influencing E. Reviews 5: Influences of Teacher Behavior A. On Student Self-concept B. On Student Behavior C. On Student Achievement – Descriptive D. On Student Achievement – Experiments and Training E. On Student Achievement – Reviews 6. Teacher-Student Relations 7. Student A. Perceptions B. Behavior 8. Methodology 9. Summaries and Essays. Author Index. Title Index. Subject Index.